A stunning example of the diversity of heritage trees is exemplified by the Shipley Cook Grove, a group of trees representing the horticultural interests of two Oregon farm families. 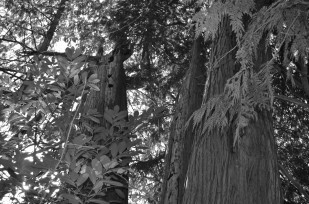 Tree varieties contained in the grove include: Sequoia, hickory, white oak, buckeye, magnolia, black locust, Port Orford cedar, Ponderosa pine, maple, chestnut (or swamp chestnut oak), filbert, mulberry, Pacific madrone, Pacific yew, white spruce, and copper beech. The farm’s original owner, Adam Randolph Shipley, had a strong affinity for horticulture. Shipley was one of the first settlers in the area to import and grow grapes. He also had a special fondness for trees and planted many stands, including the honored grove. Shipley served as State Grange Master and was appointed to the Board of Regents at Oregon State Agricultural College. In the 1860s, the Shipley family operated 1,000 acres of their Lake Oswego farmstead. Today, the historic farm (owned by the Cook family) encompasses 6.1 acres and has achieved Oregon Century Farm status, as well as National Historic Register recognition. The farm’s vineyards and trees provide important links to the northern Willamette Valley’s agricultural and horticultural history. Shipley employed a young iron worker by the name of James Preston Cook to help around the farmstead. Cook worked for Adam Shipley and later on (following Adam’s death in 1893), for Adam’s son Randolph. In 1900 James Cook had saved enough money to buy 131- acres of the farm, including the original farmhouse and outbuildings from Randolph. Cook, his wife Susie, and son William continued the Shipley legacy of planting trees, adding to the original collection. The Shipley-Cook Farmstead is currently owned and occupied by Rick Cook, James Cook’s great-grandson. In 2000 the farm’s grove of trees were recognized by the Clackamas County Heritage Tree Program. Rick Cook has made it his life’s work to preserve the farm’s history. His passion for the family farm and regional history extends to trees—Rick helped plant several yellow buckeyes within the honored grove. Learn more about the Oregon Heritage Tree Program and the Statewide Dedication event to be held on April 6, 2012 at Oregon State University.